"Debt can be an asset." In late 1988, RJR Nabisco president F. Ross Johnson joined with bankers at Shearson Lehman to engineer a leveraged buyout of the company from its shareholders. Personal politics and an attractive stock price encouraged a competitive bid from Kohlberg Kravis Roberts & Co., kicking off a feeding frenzy and a bidding war that would see buyout bids of more than double the stock's then-current price of around $53 per share. Wall Street Journal reporters Bryan Burrough and John Helyar chronicled the behind-the-scenes tale of corporate intrigue, greed and deception in their best-selling 1990 book, which was adapted for HBO in 1993 under the same evocative title, Barbarians at the Gate. The film features a veteran Hollywood cast—James Garner as extravagant Nabisco president F. Ross Johnson, Jonathan Pryce as sharkish banker Henry Kravis of KKR, and Peter Riegert as novice buyout architect Peter Cohen of Shearson Lehman. The actors were cast for entertainment value rather than physical resemblance to the actual people involved, and it's the right choice here, avoiding the creepy doppelganger effect to which TV biopics are too often prone. Larry Gelbart's screenplay plays up the comic aspects of the story, with a disclaimer at the film's end noting that elements of "satire and parody" have been introduced into the narrative. This, too, seems like the right decision—no mention is made, for example, of Johnson's coma-stricken son Bruce, and some minor players are omitted altogether, but the film doesn't suffer for it. It's a fast-and-loose but essentially accurate retelling of the book, in itself a reconstruction derived from interviews and public records. Moreover, it's consistently entertaining, with some very funny one-liners that never seem out of place, as well as a number of sardonic references to the ill-fated Premier, RJR Nabisco's foul-tasting attempt at a "smokeless cigarette." Legendary producer Ray Stark and veteran director Glenn Jordan have a fine time with the material—the narrative flows cleanly from beginning to end, staying focused on Johnson and his increasing bewilderment and concern as the arcane, inane LBO process he initiated quickly grows beyond his control. And there's a pleasantly old-school feel to the production at large—the film is driven by dialogue and character, set in boardrooms, restrooms and hallways, and told in chronological order with no fancy opticals beyond conventional split-screen effects during telephone conversation scenes. The result is a straightforward recounting of one of the biggest greed-driven events ever to happen on Wall Street, augmented by a sharp sense of humor. Barbarians at the Gate is a rare combination of history and satire, allowing us to be fascinated with the temptations and machinations of the barons of power, even as we laugh at the resulting setbacks, misfortunes and grand financial follies. Image Transfer Review: HBO presents Barbarians at the Gate in a 1.78:1 widescreen aspect ratio. The film was originally targeted for a 1.33:1 television display, but the cropping to 16:9 isn't jarring. One suspects that HBO's co-production deal with Rastar and Columbia Pictures specified "widescreen-safe" framing to accommodate theatrical release overseas, and the only time the cropping becomes obvious is during a split-screen telephone conversation, where the diagonal split would run across a 4:3 image properly but is "clipped" in 16:9. The low budget film exhibits moderate grain, and the source print exhibits a few flecks here and there. The dual-layer anamorphic transfer presents the movie with natural color and decent detail, though edge enhancement and light black level with poor shadow detail make it look more like video than film (the interlaced master also contributes to this effect). Not a terribly impressive transfer, but serviceable. Audio Transfer Review: Barbarians at the Gate retains its original Dolby 2.0 Surround soundtrack on DVD, a simple but serviceable television-style presentation. Dialogue is generally centered, backed by front-oriented stereo music with little surround activity, but a few off-screen lines and sound effects are nicely placed across the front of the soundstage. Dialogue is clear, and there is some bass activity, though dynamic range is limited. It's an appropriate DVD audio presentation of this dialogue-intensive film, but nothing out of the ordinary. The disc also features a French dub, in 2.0 Surround, and a monaural Spanish dub; as always, I'd recommend using the French and Spanish subtitles in lieu of the alternate audio, for the sake of performance quality. Extras Review: The Barbarians at the Gate didn't succeed in catapulting any significant extras over the battlements. The disc features 22 picture-menu chapter stops, subtitle and language selections, and Cast/Crew Bios that provide brief biographies and selected filmographies for cast members Garner, Pryce, Riegert and Cassidy, director Glenn Jordan, and screenwriter Larry Gelbart. 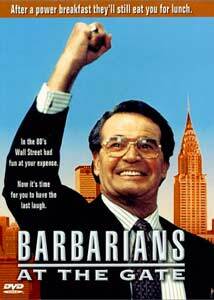 It would have been nice to have some background information on the actual Wall Street events that inspired the movie. Barbarians at the Gate recounts the tale of the takeover battle for RJR Nabisco with style and humor. HBO's DVD features a decent transfer, though supplements are scant. It's an entertaining look at American business, and well worth a little due diligence.